Heat the peanut oil on medium heat and sauté leeks and garlic until fragrant and golden in color. Turn the heat on high and add in the ground chicken. Cook until the chicken are no longer pink in color and stir in the mushrooms. Add in the oyster sauce, wine, light and dark soy sauce, and keep stirring until well combine. Then stir in the eggs, and season the chicken mixture with some pepper and sea salt. Pour in the chicken stock and bring it to a boil, lower the heat, closed with a lid, and simmer for about 35 to 40 minutes, until the sauce has thicken slightly. 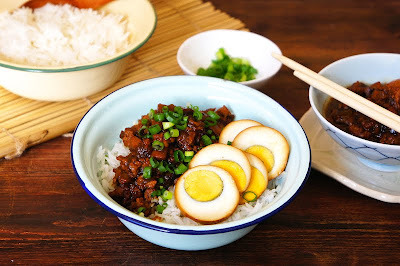 To serve the meal, scoop some steamed rice in a bowl, add some chicken mixture with its sauce, sliced the eggs, and top with scallions. Serve warm.